Exciting Times at Exe Bookkeeping and Payroll Services HQ!! Things have been excitingly busy here at Exe Bookkeeping and Payroll Services and we are proud to share our feature in PQ Magazine on behalf of the Institute of Certified Bookkeepers (ICB). 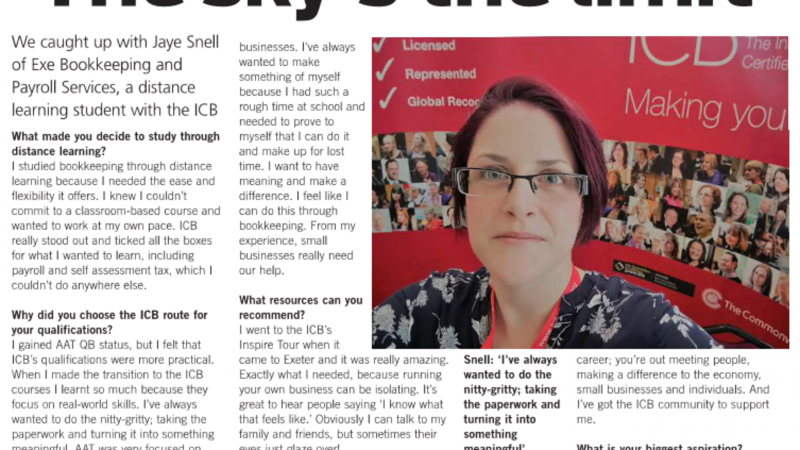 We were approached by the ICB to talk about what made us want to be a bookkeeper and the journey to achieve this, feeling very flattered, humbled and honoured, we duly obliged to talk about our story..see it below or here on page 20 of the digital version of PQ Magazine! If that wasn’t enough excitement; the ICB approached us again and this time to be be featured as part of the #ICB100 Women Campaign, honouring inspiring and influential women bookkeepers in celebration of the 1918 Representation of the People Act, which gave the first women the vote in GB and N.I. We were again, completely bowled over to have even been considered and gratefully accepted the opportunity to take part. You can read our feature over on the ICB Website here. On the back of featuring so highly in the ICB spotlight, we were also approached by our ICB training provider, Training Link who helped us achieve both our Payroll Management and Self Assessment certification; to talk about our bookkeeping journey in more depth, read the ‘student success’ story here, on Training Link’s website. It has been an amazing experience and to be asked to participate in even one of these features, let alone three has been a great honour. We truly feel that however cliched it may be, if our story inspires just one person to reach for their own dreams, that in itself is an amazing achievement. Making Tax Digital (MTD) – Are You Ready?